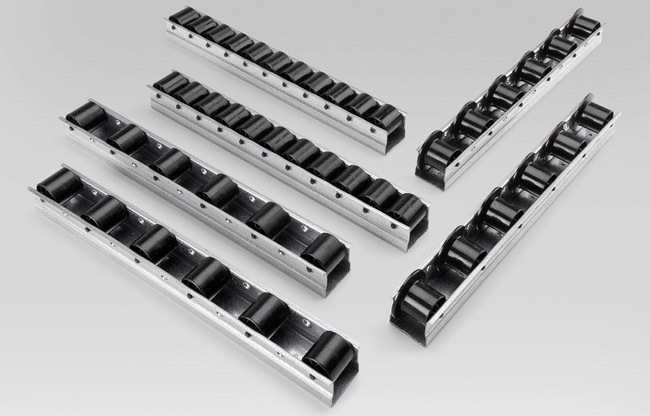 The Minirail is made of a zinc-plated profiled rod with a standard length of 2997 mm and of Polyamide wheels assembled with a 27mm or multiple of pitch. The load capacity of each wheel is 3 daN, but the system max. load capacity is determined by the profile resistance in relation to the maximum allowable camber and to the distance in-between the supports. These wheel tracks are ideal to handle light and average units to create warehouse and picking areas. They have excellent application as sliding and containing guides in the packaging processes, to produce rest and transfer surfaces combined with machines for the glass, wood panels production and for many other industries. On request and for a minimum quantity of 300 meters, tracks with “L” length different from the standard can be supplied.